Economic growth will be speeded up by lowering tax rates on businesses, thereby encouraging more investment. 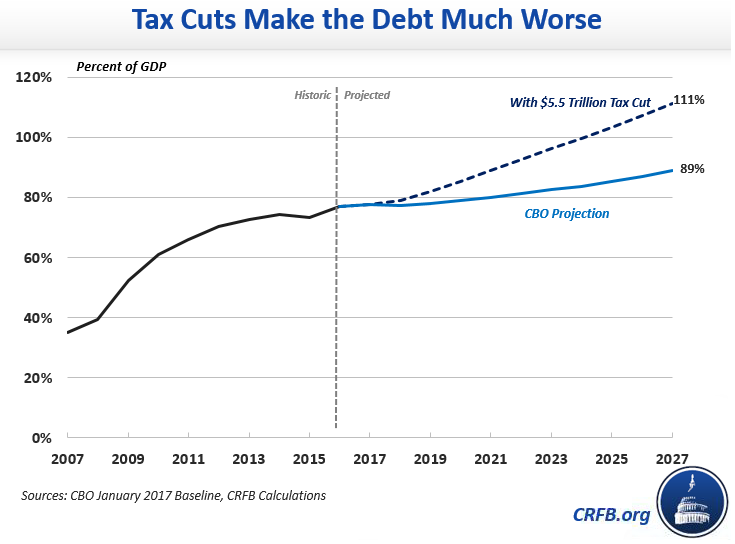 National debt will shrink because faster growth will produce more tax revenue. But this only works if the revised tax plan is revenue neutral to begin with. three tax brackets, reduced from seven. Simplification like this is a good idea. double the standard deduction. This puts more money in the pockets of the average tax payer who does not itemize deductions and is therefore a good idea. repeal of the alternative minimum tax. This only affects wealthy people and should be retained, if necessary, to make sure that overall reform does not increase the deficit. lower capital gains tax. This will encourage more investment but should not be included unless the overall plan is revenue neutral. repeal of inheritance tax. This tax feature should be retained until our annual budget deficits are eliminated, i.e. until we achieve balanced budgets on an annual basis. preserving deductions for mortgage interest and charitable contributions. The mortgage interest deduction should be greatly reduced from its current level of $1 million per residence. Wealthy taxpayers don’t need that much help. Raising the standard deduction will already help middle income taxpayers. cutting the corporate tax rate. This is an excellent idea as long as its revenue loss is made up elsewhere. It will encourage multinational corporations to bring their overseas profits back home for reinvestment in the U.S. Conclusion. The Trump tax plan has some good features as well as some poor ones. Reducing tax rates is a good idea. But adding to annual deficits is a very bad idea. With some effort it is possible to reduce tax rates in a revenue neutral way. This entry was posted in Committee for a Responsible Federal Budget, corporate tax rate, corporate tax reform, Donald Trump, economic growth, economic momentum, Jack Heidel, New York Times, tax rate cut, tax reform, tax revenue and tagged corporate tax rate, debt, deficit, Deficit spending, Donald Trump, economic growth, fiscal responsibility, jack heidel, New York Times, tax rate cuts, tax reform by jackheidel. Bookmark the permalink. I am unsure as to what you are concluding at this point. It does not appear to me that he has offered any kind of balance as to the benefits of the population and the levels of wealth in the U.S. Can you help me as to how his brief suggestions falls in line with any previous tax plans. For instance, is this one comparable to Reagan’s plan? If so, wasn’t that one somewhat of a disaster to the economy at large? Here I need more details of the operations of the plan and the potential consequences to all Americans. In brief, who seems to benefit the most here and how will the Trump supporters benefit immediately? Basically Trump is just outlining a possible tax reform plan without providing any details. Some of his ideas are good and some very poor. Reagan tax reform was positive because it lowered rates in return for closing loopholes and shrinking deductions. Your generalizations are okay, but they do not give me anything to address or consider. I am at a loss when Republican proposals for reform have done much to help the lower middle classes, let alone the poor. Policies that don’t level society will probably not satisfy me. As I tried to make clear, but know that I didn’t succeed last night, I work from the principle that the specific moment must ethically be considered now, not some time later. Thus, generalizations don’t comfort me. Rather, I try to act as if this moment may very well be my last. Living fully and knowing that it is finite prods me constantly. We have various social welfare programs at the federal level aimed at providing assistance to low-income people. I think that tax policy should have a more general purpose of 1) making the economy grow faster in order to create more jobs and 2) increasing government revenue in order to shrink our annual budget deficits in order to shrink our national debt down to a more manageable level. I think our differences rest on the means for lowering the debt. For instance, the Republican efforts to reduce the costs of “existing health conditions” with their new vote before Congress may well help insurance companies and keep costs down for the middle class. However, I find this kind of reasoning exactly similar to Keith’s remarks the other night on ‘utilitarian ethics. It may well benefit some, but not those immediately suffering. In this case, the ethic of ‘do no harm’ means living in this moment with people suffering. They are the most deserving. Again one ought to deal with the present not an abstraction in the future. Besides, I always thought capitalism should not be restricted only to “make a profit”. That practice has been exorbitant for corporate executives and shareholders. Here I refer you to the study ‘The Golden Passport: Harvard Business School, the Limits of Capitalism, and the Moral Failure of the MBA Elite’ by Duff McDonald’. A debate over the complexities of morality merit equal status with economic concerns, so I think. Our business leaders seem to have little concern. Of course, I include the political leaders as well. I don’t dwell a whole lot on how our annual deficits will be reduced, other than that it means curtailing spending to a large extent. This leaves a lot open to discussion and compromise. My main attitude is that our annual deficits MUST be greatly reduced or else we will have another fiscal crisis on our hands, much worse than the Financial Crisis of 2008.